Ready for thrills upon the seven seas, sailing aboard a Spanish galleon manned by a mad crew and lead by a ruthless captain? 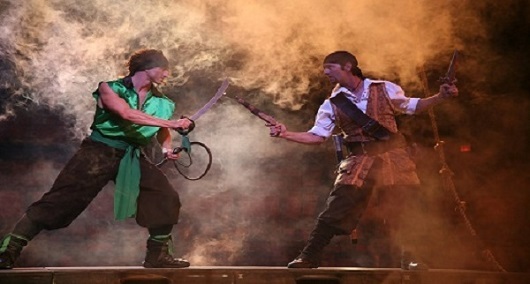 Swashbuckling escapades and good food await you at Pirate’s Dinner Adventure in Buena Park, CA. In the show, the evil pirate, Captain Sebastian the Black, has returned to take his revenge. Kidnapping the king’s daughter, Princess Anita, and the Golden Gypsy, he plans to use them to find the legendary treasure of the terrifying Sea Dragon. But the captain’s son, Benjamin, has fallen in love with the princess, and must decide where his loyalties lie. The audience cheers for their favorite pirate to become the first mate. Pillaging and plundering make hungry pirates, and dinner thankfully comes with admission. Enjoy chicken, shrimp and vegetable skewers, cake for dessert and unlimited soft drinks. Adult "grog-lovers" can head to the bar for liquid libations.